Florida Atlantic University’s College of Engineering and Computer Science and Broward County Public Schools, Innovative Programs Office recently co-sponsored a “Growing STEM” summit at Engineering East on the FAU Boca Raton campus. 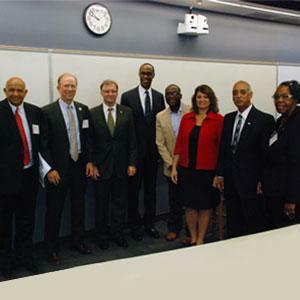 The event brought together community leaders to address how to advance the agenda for change in science, technology, engineering and mathematics (STEM) education, policy and workforce development. The summit was attended by more than 80 leaders in government, industry and education in Broward county, including Robert J. Stilley, FAU, board of trustee member and president and chief executive officer of HeartCare Imaging, Inc.; Florida House of Representatives, Gwyndolen Clarke-Reed, district 92 and Shevrin D. Jones, district 101; Laurie Rich Levinson, chair, The School Board of Broward County, Florida; Robert W. Runcie, superintendent, Broward County Public Schools (BCPS); and Gary W. Perry, FAU, interim provost and chief academic officer. The keynote speech titled “Building America’s Future through STEM Literacy” was presented by Stilley. The agenda for the event included two town hall-style discussions, STEM critical conversation breakout sessions and collaborative planning focus groups with regional leaders. The panel one discussion titled “STEM Workforce Development, Present and Future” was moderated by Pete Martinez, chairman of the board, executive vice president, Technology Development and featured panelists Clarke-Reed; Runcie; Amir Abtahi, Ph.D., P.E., associate professor of mechanical engineering at FAU; Juan F. Caraballo, program director, Corporate University and Innovation Programs, IBM; David Codington, vice president, Greater Fort Lauderdale Broward Alliance; Tom de Groot, senior program manager, Lockheed Martin; Chris Fleck, vice president, Citrix Systems, Inc.; and BPCS representatives, Marie DeSanctis, executive director, Instruction and Interventions; and Tony Hunter, chief information officer. The purpose of the panel was to identify essential components to design a seamless K-20 pipeline and methods to strengthen STEM content knowledge. The panel two discussion titled “Innovation STEM K20 Curriculum – Design and Delivery” was moderated by Nancy Romance, Ph.D., professor, FAU College of Education and featured panelists Jones; Buck Martinez, senior director, FPL; Paul Rushfeldt, former vice president, Lockheed Martin; Glenn Thomas, executive director, Palm Beach County Education Commission, Inc.; BCPS representatives Desmond Blackburn, Ph.D., chief performance and accountability officer; Leslie Brown, chief portfolio officer; Jose Dotres, chief academic officer; and Jeanine Gendron, Ph.D., director, STEM and Instructional Resources; FAU representatives Ilyas; Donna Chamely-Wiik, Ph.D., director, Quality Enhancement Program; and Javad Hashemi, Ph.D., chair, department of ocean and mechanical engineering. The purpose of the panel was to identify legislation and education policy components needed to strengthen the K20 educational system and strategies to establish and expand partnerships between industries and K-20 educational institutions. The collaborative planning focus groups discussed the needs of industry and K20 education that were identified in the panel discussions to establish partnerships with industry, FAU and BCPS, and identified elements needed to expand the STEM programs recently established at six Growing STEM Magnet middle schools – Apollo, McNicol, Parkway, Lauderhill, Margate and Silver Lakes. The “Growing STEM” program is part of the STEM initiative in the Magnet Schools Assistance Program grant awarded to BCPS by the U.S. Department of Education. The purpose of the grant is to help increase student achievement and create interest in STEM disciplines at the post-secondary level, as well as in a variety of STEM-related careers. FAU’s College of Engineering and Computer Science was chosen to assist BCPS to design a curriculum suited for middle school students. FAU faculty and students within the college hosted a 2012 STEM Summer Teachers Academy, a 2012 and 2013 STEM Summer Student Academy and a 2013 Teacher Workshop to help implement the new curriculum in the six Growing STEM Magnet middle schools. l-r: FAU, College of Engineering and Computer Science, associate dean for academic affairs, Ali Zilouchian, Ph.D., P.E., Board of Trustees member, Robert J. Stilley, interim provost and chief academic officer, Gary W. Perry; BCPS, superintendent, Robert W. Runcie; Florida House of Representatives member, district 101 Shevrin D. Jones; The School Board of Broward County, Florida, chair, Laurie Rich Levinson; FAU College of Engineering and Computer Science, Interim Dean, Mohammad Ilyas, Ph.D., P.E. ; Florida House of Representatives member, district 92, Gwyndolen Clarke-Reed.